With beautiful sunshine and warming temperatures unfortunately that means the ice in the rink is no longer sustainable. Thank’s to all who came out this season and enjoyed the ice, we look forward to seeing you next winter! Family day thank you message! Thanks to all the members who made it out and we hope to see everyone again at Ski Night in March! Our President Heather Trapp offers this message! What a great, sunny day for the Lessard Community Annual Family Day Winter Party!! 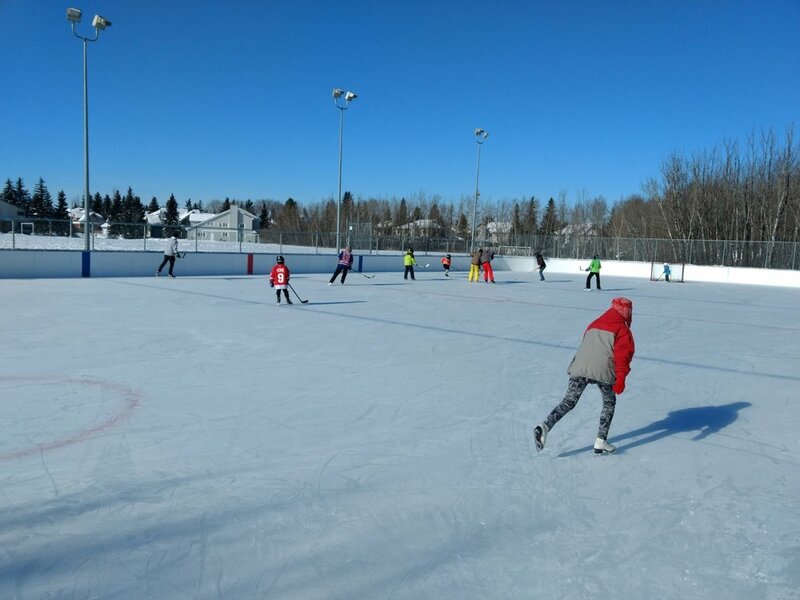 Despite the -16°C temperature with the gusting wind making it feel like -30°C, over 60 community members braved the cold to skate, play hockey, and roast hot dogs, veggie dogs, smokies, and s’mores on one of the two fire pits. Inside while warming up, people could listen to our guest pianist play old time music. Our rink Manager, Earl, had the fires burning warmly and the ice rinks in perfect condition. We invited a local senior to play the piano for the event and that was an absolute hit!! He played many family-favourite songs that even had some people dancing. At 1:00 the puck dropped for a fun hockey game. Players from 6 – 56 years braved the cold and squared off. Two families received a door prize consisting of a Family All Facility Admission to any of the City of Edmonton’s Recreation Centres.